Jungle Red Writers: Are You Shopping? We have just hit some kind of Rubicon with the grandchildren. My 11-year old GC announced yesterday that he had “one additional thing to talk about” and that “If you don’t mind, Grammy” he was asking for “cash” for his holiday gifts so he could save p for a “big, speedy computer.” So much for the days of Thomas the Tank Engine, I guess. But of course I am grateful for the baby children, and as the sun rises on this day after Thanksgiving, I am thinking about the year to come. And what I’m grateful for. And as the debut novelist (and the first woman to win the St. Martins/PWA Best First PI novel competition in ten years for WINK OF AN EYE) Lynn Chandler Willis reminds us, the next good idea could be right around the corner. Even in adversity! Like when you're forced to shop for--tires. While I waited for the limo to take me to my book launch, I pondered the glamor of it all. No, really. Ok, I made up the part about the limo, but as the day approached, I did ponder. And I did wonder about that glamor part, too. See, I had a book signing and reading scheduled on release day. Yeah! But as the day drew closer, I noticed my car was driving really wonky. Like really wonky. Kinda possessed like. I mean, seriously, when the road was wet—my car could fly. Airborne. Hydroplane. What ever you want to call it. The wrecker service likes to call it bald tires. And, I'm kinda OCD about some things. Like driving in bad weather. I know—I know...all you northerners and mid-westerners can stop laughing now. I'm from North Carolina. Me, a car, and anything wet on the road doesn't mesh well together. I once had my son, who was only 16 at the time, drive me to work on a snowy day because I was too scared to. He was 16. Like because he was a guy, I felt safer with him driving. Go figure, right? Well my book launch was coming up and I was keeping an eye on the weather. Truth be told (Wow! That would make a killer title for a novel.) I started watching long range forecasts six months ago, fretting about some freak snow storm blizzard thingy that could possibly (but probably not) drop a tenth of an inch of snow on our North Carolina roads. The long range turned into the thirty-day, which turned into the ten-day and then the seven-day forecast and no snow or ice was predicted but we were supposed to have a cold, rainy day two days before my book launch. I needed new tires. If I was going to arrive at my book launch/signing/reading/reason to party I was going to need something with at least a little bit of tread on it to get me there safely. Know that insurance commercial with the college kid on a “ramen noodle budget?” I'm not quite that bad, but am on a tight budget. I've also got nine young grandkids who still get all excited about Christmas, and, five of them have November birthdays, soooo...from the end of October through mid-December, any extra money goes toward birthday presents and Christmas gifts. New tires certainly didn't fit into my fourth quarter budget. So I seek out one of those little corner shops that sells, um, gently used tires. As opposed to run ragged used tires. I pulled into the first shop I saw with rows of tires proudly on display near the road. Horseshoe hanging on the wall. It was an old, gently used former full service gas station. No, actually, there wasn't anything gently used about it. Half of the painted on letters in the name of the place were scratched off or through so I was either at Frankle's or ankle's, or maybe it was Frankie's? It was hard to tell. Either he looked at my bald tires and assumed that was my reason for being there, or he read my mind and knew I was anxious to get this show on the road. He was not a man of many words. He told me he had a pair of the size I needed and I could wait in the “office” where it was warm while he put them on. But before I headed to the warmth of his office, a buddy in a Pickup truck pulled up and hollered (we are in the south) “Hey, Muffy, you got a blah blah blah?” I couldn't tell you what he was asking for as all I heard was blah blah blah...Muffy was what had grabbed my attention. A guy wrapped up in an oil-stained coat that could withstand a -80 degree blizzard was named Muffy. I loved it. As I sat in Muffy's office freezing to death—the portable heater barely worked—I fell in love with the whole thing. 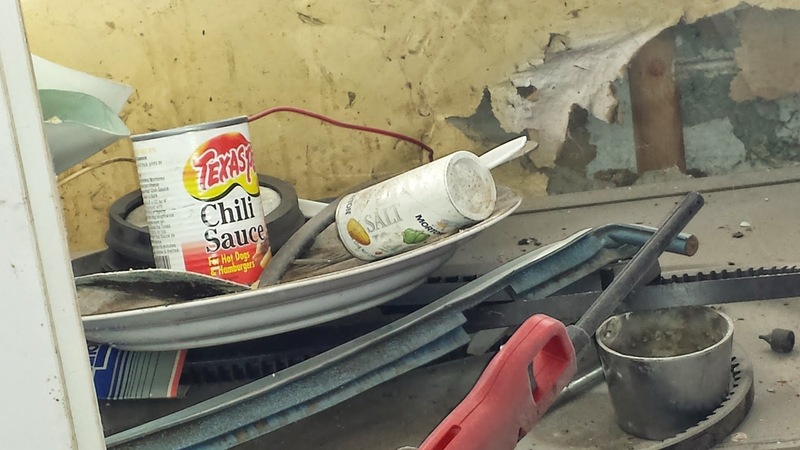 The can of hot dog chili sauce in the paint-chipped, broken cabinet. 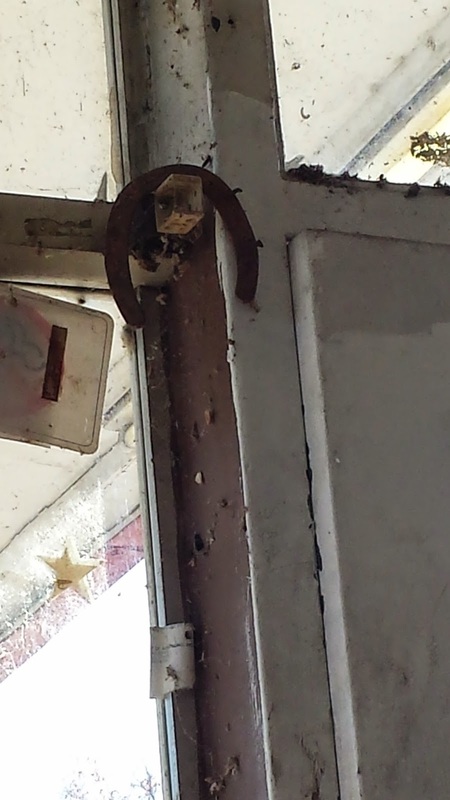 The horseshoe beside the door. 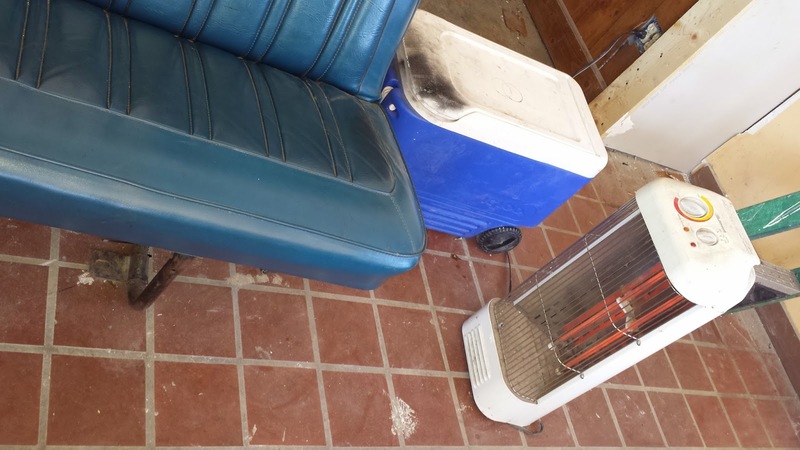 The old bench seat salvaged from some old truck. And Muffy. And that is where inspiration comes from. HANK: See? You never know! So—given that your tires are okay—are you shopping today? For gifts—or for ideas? Shopping today is my idea of pure torture. Would I willingly choose to stand in a line that goes three-quarters of the way around the store in hopes that I might be able to get a videotape for my grandbaby at a reduced price? Please, save my sanity; it's worth paying a higher price if I can skip the insanity of shopping today. Considering that I despise driving, bad weather or not, I loved your story, Lynn. Now I've got to add "Wink of an Eye" to my still teetering to-be-read pile . . . .
No shopping, no way! I'm at home, making breakfast and reading classic horror. Lynn, your story sounds fascinating. Ah, one more author to start reading, one more reason to be thankful! I'll never run out of reading material! I HATE shopping and do it only when absolutely necessary. This fall I was stuck having to buy clothes for work since the ones I'd been wearing were not fit for the rag pile. After each shopping trip (no way I'd spend an entire afternoon shopping)I'd go home and ice my back! Yesterday I visited my disabled sister at a nursing home and shared a meal with her in the dining room. I think it's great that residents are encouraged to invite family over for a holiday meal. After having a lovely time with her and watching other residents eating with relatives, I drove back to the city where I live. In a shopping center I drove past, there was a long line of people waiting to get into Best Buy, which had not yet opened. I'm not sure when they started lining up, but the line went from one end of the parking lot to the other. I KNOW I had a better Thanksgiving than they did! Love the Muffy story--thanks for that! As for shopping, I have ordered some things online from my favorite stores in CT (RJ Julia Booksellers) and Alaska (alpenglowskincare.com), and we'll probably go poke around Key West this weekend too! Shopping? Nooooooooo. Even if I had too (and I'm a person who loves loves loves to shop!). But. My Christmas shopping is all done and the packages are all wrapped. Lynn - Welcome! What a great story! I'm so tickled you took pictures. MUFFY! That made me laugh out loud. I have to say, even without reading about your book, I would have been interested because of how wonderfully you told your Muffy story. 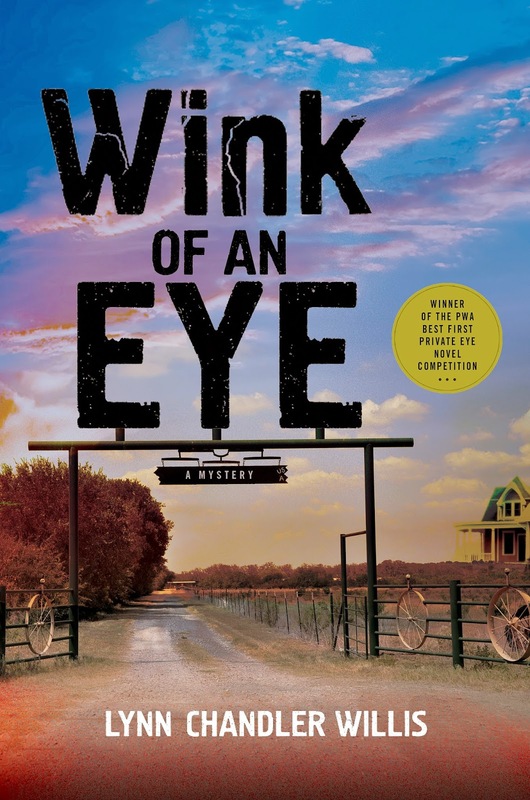 "Wink of an Eye" sounds very much like my kind of book and I look forward to reading it. And glad to "meet" you here at Jungle Red. I have commuted 5-10-sometimes 12-hour drives to work projects, but at heart, I hear ya, Lynn!! My worst bugaboo is night-time driving through a strange city. But the people I meet when I stop to panic (uh, catch my breath)! Based on the story you shared, I can guess your book is going to be a pleasure to read. And no Black Friday for me, unless you count a few mouse clicks. Hope everyone had a great Thanksgiving. I'm staying home and editing today — LOATHE shopping. Would much rather be in our snug apartment with cats, tea, and manuscript. I live in the Frozen Tundra of Wisconsin, but I have a healthy respect for icy roads. If you don't have to go out, don't. If you do, make sure you have good boots and gloves and a hat in case you get stuck somewhere and have to wait or walk somewhere. As for shopping the day after Thanksgiving, in our youth, a friend and I used to take the train to Chicago for Black Friday, run directly to Marshall Field's (now Macy's), stash our stuff in a locker on the floor (4th, I think)where the restaurant was, and shop from the top of the store to the bottom (we usually arrived at the restaurant floor around mid-day, stashed our purchases in our locker, grabbed lunch, and then shopped our way down to street level, then went up and retrieved our stuff, had dinner in downtown Chicago, and caught the train home). Now there is nothing I need badly enough to coax me out into those crowds. A long time ago I worked a series of long-term temporary jobs. At the last temporary job I had, the first couple of weeks I was there I kept overhearing people telling each other: "ask Bunny to help you"; "Bunny knows how to do that"; "Bunny knows who to call", etc. I always pictured a blue-eyed blonde cheerleader whenever I heard Bunny's name mentioned. By the time I left there for a permanent job, Bunny received a well-earned promotion to department manager. And Bunny was a portly middle-aged man from Jamaica! Joan - I'm with you. We should start a campaign to save the sanity. Of course that could apply to more than just shopping! Gram - 30 guests! Sounds like my "little" family ;) Enjoy! Alice - classic horror? Interesting choice for Thanksgiving...I've heard a lot of Thanksgiving horror stories and they all some kind of kitchen mishap. Deb Romano - what a wonderful story. No doubt you were where you wanted to be yesterday and your heart is happy for it. Lucy - I'm with you - if I can click and buy, I'm all over it! Kaye - nice to meet you too! How did we ever document our lives before camera phones? Shopping? No freakin' way. I've worked/managed retail at the mall too many times to ever go near it again. Yay Internet shopping! But not today. Maybe. Thanks for sharing new authors with us. The Muffy story is great! I KNOW--the mall! Talk about a horror story.. At least, so far, I'm not doing the TV coverage of the shopping, I'm up in the investigative unit. Um, hiding. And I may not even put on my heels. I'm also deleting DOZENS of "black friday" offers from my email. Note to vendors: nope, nope, nope, I don't even open them. OK, you couldn't melt me and pour me into a store today. That's my idea of torture. In about another week, I won't even venture to the Costco until after the New Year! Lynn, your book sounds very intriguing, and congratulations on the awards. You're living in NC now, but were you a Texas? You've certainly hit the setting, culture, and language on the nose. Is there really a Wink? * Kait - nope, born, bred, and will more than likely die right here in the Tarheel state. I've been to Texas once on business. Flew into Dallas/FW, stayed two nights, and flew back home. In my corporate job, I worked with sales reps and customers in Texas so have quite a few friends in the Lone Star State. Hi Lynn--Love your story! And, as a Texan, I can say it sounds like you hit the mark with Wink. Congrats!!!! Shopping, Hank? Argghh. No way. Although I might have to go to the feed store for some dog food... And I might just make my Christmas list and venture online... Procrastinate, me? First, congrats on the book. Put it at the top of my to-buy list, what a story. And are you sure you weren't in Indiana? I think I've been in that garage. Shopping today - nope. An old friend and I do an annual Christmas shopping day. When the kids were small it was really about shopping. Now it's more have coffee, look in the windows, eat lunch, look in the windows, have a snack . . . you get the idea. I knew the grandkids were growing up and shopping had changed when one of them said "To make it easy on yourself, Grandma, why don't you just give me money?" Now we have the great-grandkids to buy for so it's fun again, but they are long distance so I do that online. (And Miss Delaney Kay, g-grandbaby #5, made her surprise appearance last night!). Hurray for Delaney Kay, our newest Red, who has the most fabulous name ever(What a good character name, huh?) and is a very very lucky girl! That is the sweetest story, Lynn. Muffy! Sounds like a wealthy Connecticut (sorry Lucy) socialite. Congratulations on the book. Hoping your launch is a HUGE success. Sounds as if you have a fanTAStic sense of humor. Shopping? My goal is to go ONCE before Christmas, in by 10 out by noon... with a shopping list. Not this weekend. * Deborah - thanks, that's quite a compliment coming from a native Texan! * Grandma - I'm with Hank on the name. Delaney Kay - you can just hear the personality spilling out of that one. Ha ha ha, Lynn! Very resourceful! Yup, there's a Wink. Also Notrees, although there might be one in town. And don't forget Muleshoe. I'm going through the do-I-have-to-buy-new-tires dance now. When I had my jeep in the shop last month, the liaison with the mechanics told me my tires were old. Yes, the tread is excellent, but after so many years glue on the inside of the tire starts to fail. With no warning. Not what I wanted to hear! So I think about that everytime I'm on I-10. Bleah. Hank, I finished Truth Be Told. Great ending with lots of surprises. So, when's the next one out? Shopping on Black Friday? No way! I haven't even left the house today. Thank you, PAt D! HURRAY! SO pleased you enjoyed it. Yay.